The subject of a recent twenty-year retrospective at the Bruce Museum, Gilje was described by Robert Rosenblum in the accompanying catalogue as “[covering] not only an encyclopedia of styles—from ancient to soft-grained photography, from the hard archaic clarity of Ingres’s hyperrealism to the pulsating warmth of Rubens’s living flesh—but also the widest range of human situations that can switch abruptly from public personae to domestic intimacies.” Witch’s Brew will feature new works in which Gilje includes herself in various guises enacting scenes from Renaissance and Baroque paintings—some based on those she conserved over the course of her former career as a restorer. Gilje guides the viewer to identify with her role as artist and living agent in the artwork to recontextualize the figures they contain as beings complete with desires and neuroses, rather than as mere allegorical symbols or vessels of painterly prowess as they are often interpreted by modern viewers. In Self Portrait Slaying a Rooster after Artemisia Gentileschi’s Judith Slaying Holofernes, 2012, Gilje appears as the agent of violence, Judith slicing off the head of a dragon size rooster, and in Self Portrait as Bouguereau’s The Assault, 2012, as the cherubic object of love, the target of paint brushes rather than arrows. The centerpiece of the exhibition, The Birth of Tragedy after Giuseppe de Ribera’s Drunken Silenus, revises a work that Gilje restored at age twenty-four, one she grew to know intimately over many months of apprenticeship at the Museum of Capodimonte in Naples, Italy—a pivotal moment in her artistic development. In the original, an obese Silenus is fed wine by two satyrs, attended by an elf-like figure and a donkey; Gilje presents herself as a pointy-eared impish figure while the donkey rides into the scene on a motorcycle, and a tattooed Silenus’s chest reads “The Birth of Tragedy.” The painting is joined by a series of new works that provide cheeky commentary on social networking, a reprise of her signature series in which contemporary pop cultural and artistic figures are inserted into renaissance-era portraiture. The resulting works offer a more complete understanding of the original subjects as well as Gilje’s ingenious adaptations of them. A native of Brooklyn, who continues to live and work in New York, Gilje is a graduate of the City College of New York, and studied 16th and 17th Century Italian art at the Museum of Capodimonte, Naples. 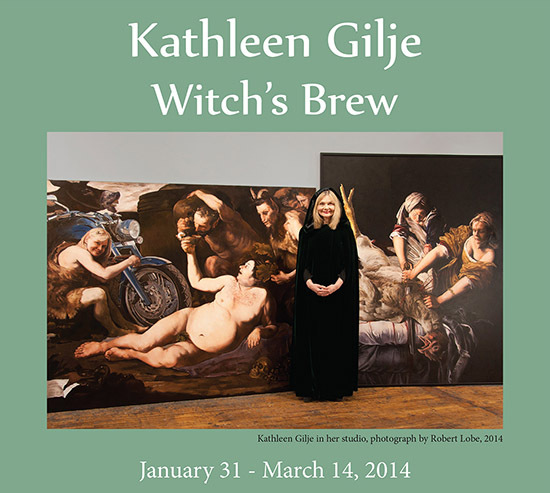 An accomplished painter and restorer, she first began exhibiting in 1972. She has exhibited in institutions that include the Bruce Museum, Greenwich, CT; the National Museum of Women in the Arts, Washington, DC, the National Portrait Gallery, Washington, D.C.; New Museum, New York, NY; P.S.1, Long Island City, NY; White Columns, New York, NY; the Weatherspoon Art Museum, Greensboro, NC; Addison Gallery of American Art, Andover, MA; and the Williams College Art Museum, Williamstown, MA. Her work is in numerous collections including the National Portrait Gallery, Washington, DC; the Musée Ingres, Louvre Museum, Montauban, France; the Granary, Collection of Melva Bucksbaum and Raymond Learsy, Sharon, CT; the National Museum of Women in the Arts, Washington, DC; the Ulrich Museum of Art, Wichita, KS; and the Bass Museum, Miami, FL. In 2014 a museum retrospective of her work will be held at the Flint Institute of the Arts in Flint, Michigan.